The ability to effectively and efficiently audit IT controls and IT security, whether internal or external, financial or operational, business or regulatory, is increasingly important. This white paper discusses the growing demand for IT security auditing and why current approaches—manual procedures, scripts, and network vulnerability scanners— fail. It then offers criteria for an ideal solution. 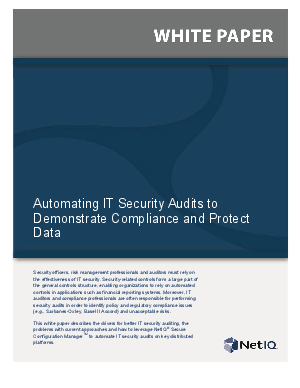 The paper concludes by describing the ways NetIQ’s award-winning Secure Configuration Manager tool automates and streamlines the IT security auditing process, freeing up auditors to perform more valuable tasks, such as interpreting and reporting results, formulating recommendations, and moving on to the next audit.